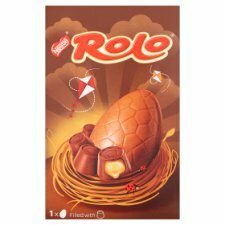 Milk chocolate egg containing Rolo® chocolates (milk chocolates with a soft toffee centre (45%)). 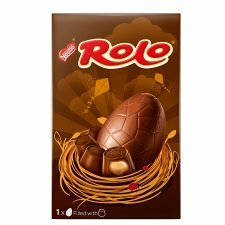 ROLO® Medium egg is a smooth milk chocolate egg with 2 tubes of Rolo chocolates- delicious milk chocolate cups with a soft toffee centre. The ROLO® sweet is a simply delicious combination of sweet, buttery, smooth, soft golden toffee encased in a milk chocolate cup. ROLO® was developed in England by Mackintosh's and were launched into the UK market in 1937 in its iconic tube. It was initially produced at the Mackintosh factory in Norwich, in 1994 production was transferred to Nestle's Fawdon factory in Newcastle, UK, where they still continue to be made to this day in their billions! If you like this why not try our selection of Large Eggs?